When I’m working on a complicated composition that might involve a lot of pencil work and erasing, I like to draft sketches on inexpensive paper, and then transfer my final sketch to watercolor paper. This prevents me from overworking the fragile fibers of the paper, which can impact the flow of watercolor paint. My techniques for transferring images vary depending on the scale of my subject. I might use a projector for large paintings, a window or light box for medium sizes, and for smaller sketches, I prefer to use tracing paper. Sketching on tracing paper has its advantages. The paper is cheap and transparent! I can erase and rework images, and easily retrace them and start fresh. It gives me a chance to get to know my subject. 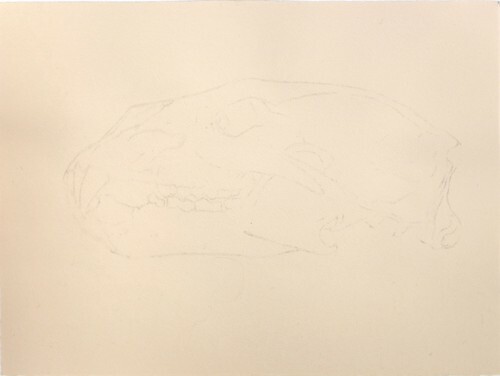 Here’s the tracing I completed for my painting of a life size polar bear skull. Once you have a completed sketch on tracing paper, the puzzle is how to transfer the image in the correct orientation. Turning the initial sketch facedown on the paper would result in a mirror image being transferred. This can be solved in a few ways. On technique is to scribble graphite on the back of the paper and retrace the front of the sketch. 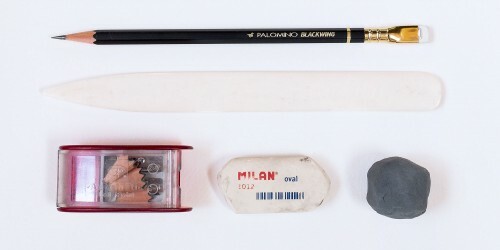 This is effective, but can result in additional smudges from the excess of graphite. You could also purchase carbon transfer paper, but I don’t have any experience with it–I prefer to use what I already have on hand! The technique that I find cleanest and simplest is to create a fresh mirror image (reversed) tracing of my first sketch. With this trace, I focus on the primary contours of my image and use a soft pencil such as a Palomino Blackwing (I can’t resist nice looking tools). Now when I turn this sketch facedown on the final paper, the image will be oriented correctly and I can rub the tracing paper with a bone folder, spoon, or my fingers to transfer the graphite. The result is a very clean, light image. The paper I’m using in this example is my favorite Arches Cover Cream. 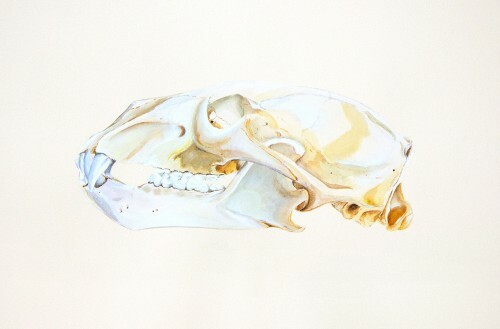 I love it for natural history studies, which I paint with watercolor and white gouache. This is the final painting I completed from the original polar bear sketches. Creating a mirror image for transfer — that is a great idea! Would it be as effective if you just traced the reverse side of your tracing paper with the Blackwing, placed it down on a new sheet and rubbed the front? I think that would work fine, although one reason I like making a fresh mirror tracing is that it gives me the chance to simplify and clean up the image. Experiment and see what works best for you! I create a water color painting from a sketch about every other year (long revolving list of media and projects…) but always use carbon paper for tracing to a painting surface when needed. I cannot get over the odd maternal feelings I have when I view the skeletons of my earlier work sketched out on my favorite carbon. Seeing where these paintings started and knowing where they’ve traveled, and how they’ve matured — as proud of them as of my children – and myself! Though you don’t state it, I suppose you turned the original over and traced from the back side. 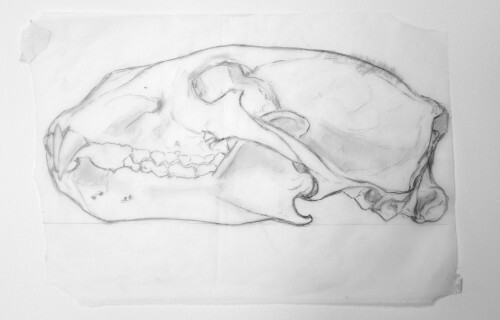 And the ability to trace either side is yet another advantage of drawing, from the beginning, on tracing paper. I have a question: How would you go about making a reverse tracing if the initial image is not on tracing paper but on thicker paper, even board? And assume you have no devices like light boxes or projectors? My method is to have 4 sheets of paper on top of each other: A B C D.
A is not needed but is tracing paper laid atop the drawing if you don’t want to ruin it by tracing over it. When you trace your sketch now, a reverse tracing will appear on the underside of C.
Hi Matt, I would use the same process I detailed above to transfer an image from a board onto a new sheet of paper. With 2 sheets of paper, I would use the first sheet to lightly trace the original image, then I would create a mirror image tracing with the second sheet using a nice soft graphite pencil. The mirror image tracing can be pressed onto the fresh sheet. Good luck! 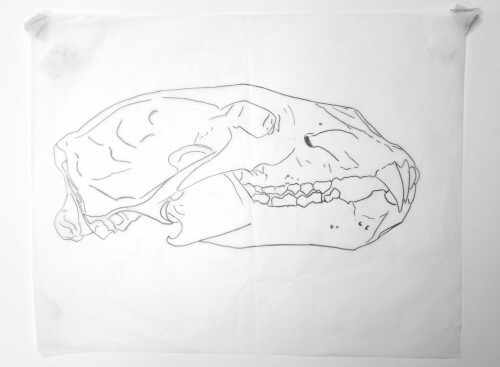 Suggestion: To create a reverse drawing for transferring, place a sheet of clear treated acetate over the original drawing, copy drawing lines with a micron black ink pen. Remove original drawing. 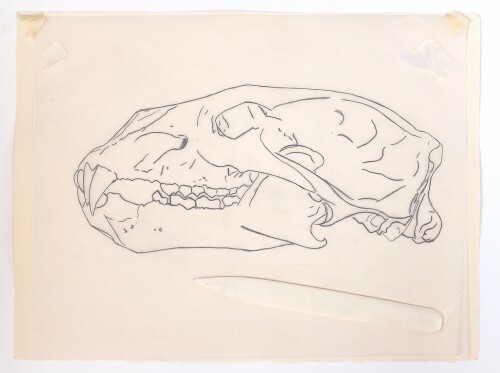 Flip over the drawing on acetate onto a sheet of any kind of white paper so you can see the line drawing you just made on acetate, and place a sheet of tracing paper over the acetate, and make your drawing with pencil on the tracing paper. Then, flip the tracing paper drawing over onto the good paper, and either rub the lines to transfer the drawing to paper, or trace over the lines on the tracing paper with a pencil to transfer the tracing paper drawing onto the new good sheet of paper. This technique avoids damaging the original drawing. That’s a great suggestion, Diana, thank you! How I flatten my watercolor paintings before framing.